Yesterday we looked at alternative gravitational models (specifically Modified Newtonian Dynamics) as a solution to the problem of gravitational lensing and stellar motion not matching the observed masses of galaxies. We saw that observations of colliding galaxies such as the Bullet Cluster show that the mass distributions observed directly don’t agree with the distributions calculated by gravitational lensing. This pretty much kills the alternative gravity models, because you wouldn’t expect the two results to be radically different if they are both due to the same mass. A further nail in the coffin for alternative gravity is that there is another model that not only agrees with the observations we have, but also predicted the behavior of the Bullet Cluster. That model is dark matter. When originally proposed in the 1930s, dark matter was thought to be regular matter that was simply difficult to observe, such as brown dwarfs, black holes, rogue planets and the like, collectively known as MACHOs, or Massively Compact Halo Objects. As our observations got better it became clear that while MACHOs could be part of the “dark mass”, it couldn’t nearly account for all of it. The reason for this is that regular matter interacts strongly with light. It can give off light, absorb light, cause polarization, and all sorts of interactions that can be observed by astronomers. We don’t see such interactions even remotely at the level expected if MACHOs made up 90% of a galaxy’s mass, so most of the “dark mass” must be something else. Something that doesn’t interact strongly with light. In formal terms that means most of dark matter must be non-baryonic matter. Baryons are particles like protons and neutrons found in atoms, so baryonic matter consists of the regular atoms and molecules that make up you and me, the stars and planets. Non-baryonic matter must be something else, and this something else doesn’t interact strongly with light. Light is a form of electromagnetism, and it is the electromagnetic forces that hold atoms and molecules together. It is also what makes things seem “solid”. When you press your hand against a table, the electromagnetic forces between the electrons and protons in your hand and in the table are what keep your hand from pushing through the table. Solidity is an effect of electromagnetic forces between objects. So if dark matter doesn’t interact strongly with light, it must also pass through regular matter really easily. Even though dark matter doesn’t interact much with light directly, the gravity from its mass does interact with light. So even though we wouldn’t see dark matter by the light it emits or absorbs, we would see its effect not only in the stellar motion of galaxies, but also through gravitational lensing due to its mass. So dark matter explains why gravitational lensing by galaxies and the stellar motion of galaxies don’t agree with the amount of mass we see in a galaxy. We can’t see dark matter directly. We can only see its gravitational effects. This leads to a prediction about objects like the Bullet Cluster. The Bullet Cluster consists of two groups of galaxies that are colliding into each other. As they collide, the regular matter of the galaxies interact and are bunched together in the middle. It is kind of like two crowds of people moving in opposite directions and causing a packed crowd. Since the dark matter can pass through regular matter easily, it’s motion isn’t hindered. The dark matter from each group just passes through the pile up and on to the other side. So if dark matter is real, you would expect to see the regular matter from the galaxy groups bunch up in the middle, while the dark matter keeps going, right through the central matter and on to the other side. This is exactly what we see with the Bullet Cluster. Direct observation of regular matter puts most of it in the middle, but much of the gravitational lensing occurs on the outer edge. This is because most of the dark matter has passed through the center, and lies at the edges of the cluster. We can’t see it directly, only its gravitational effect. So dark matter not only agrees with observation, it correctly predicted the Bullet Cluster results. So observational evidence supports the idea of some kind of non-baryonic dark matter that makes up about 63% of the matter in the universe, and tends to clump around galaxies. 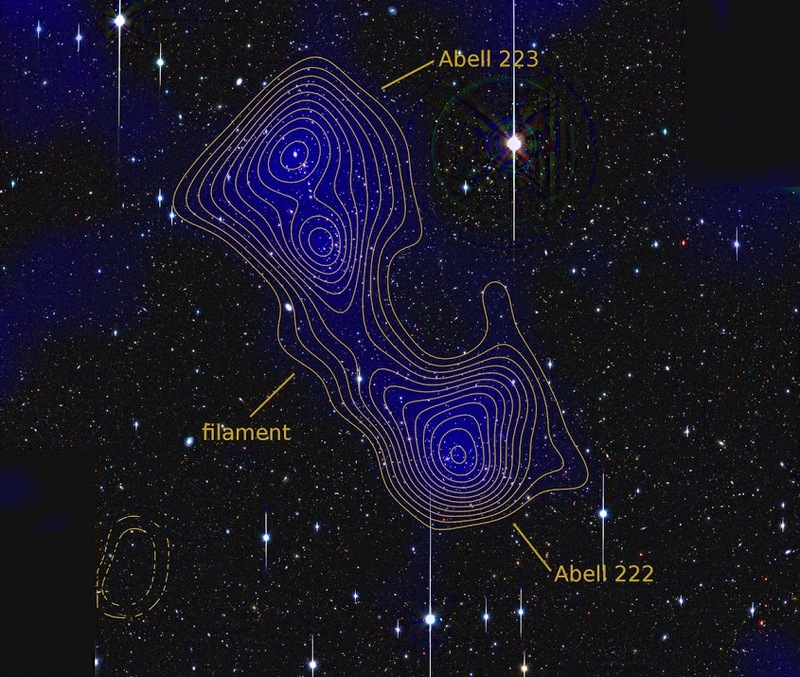 We can even use gravitational lensing to map the distribution of dark matter in a galaxy, such as the dark matter map of the Abell cluster seen above. Here the contours represent dark matter density, in much the same way that a topographic map shows elevation. Of course we haven’t really pinned down what dark matter is. We’ve only said that dark matter isn’t the regular baryonic stuff we see in our daily lives. This is perhaps the main reason why there are so many dark matter skeptics. After all, if you don’t know what something is, how can you say it exists. This isn’t helped by the popular press, which often portrays dark matter as a great cosmic mystery that astronomers can’t comprehend. But as we’ve seen, we can see dark matter through its gravitational effects. We can even make dark matter in the lab. Neutrinos are particles that have mass, are non-baryonic, and don’t interact strongly with light. Neutrinos are a form of dark matter. We can not only observe neutrino interactions in the lab, but we can produce neutrinos in particle accelerators. We don’t yet know exactly what the mass of neutrinos are, but we have some broad constraints on their mass. So if neutrinos are dark matter, and we can observe them in the lab, why the constant news articles about the search for dark matter? Why do we keep reading things like “Scientists may have discovered dark matter!” if we already know about neutrinos? The reason is because even though neutrinos are a form of dark matter, they cannot make up all the dark matter in the universe. There aren’t enough neutrinos in the universe, and if dark matter were only made of neutrinos it wouldn’t clump around galaxies in the way we observe. There must be something in addition to neutrinos that makes up the majority of dark matter. But we’ll talk about that next time. So…question: going back to the first post and the distribution of velocities…why would the extra mass from the dark matter not result in a distribution which matches the classically predicted distribution, but over much larger distances? Or, put another way, why does the baryonic matter not distribute into a disk which is broader, why does it clump up at the center? Intuitively, I suppose, I’d expect dark matter to be subject to the same angular momentum concerns as the baryonic matter. Taken together, you’d end up with simply a much larger disk where the baryonic matter is diffused through the disk. What about the Abell 520 cluster? I read that this collision is not behaving as predicted by dark matter. Have there been any good answers to the puzzling observations of this merging cluster? I cannot agree: Calculated from Omega(m) = 0.3 and Omega(bar) = 0.047 this yields for Omega(dark) = 0.253 and thus DM makes up 84% of all matter in the universe and baryonic matter only 16%..
More: Have there been any good answers to the puzzling observations of the Abell 520 merging cluster? PS: your posts are interesting and easy to read. Thanks!